"Shop for fine art and handmade crafts at over 90 vendors; listen to the sounds of the season; and enjoy festive fair foods at the Wylie Arts Festival December 3 in historic downtown Wylie's Olde City Park from 10 am - 8 pm. There is something for everyone throughout the day including the arts and crafts, Santa Claus, a community canvas, Festival of Lights Christmas Parade at 5:30 pm, and Tree Lighting Ceremony at 7 pm. Come out and enjoy the sights and sounds of the holidays." "Tarleton State University located in Stephenville, TX located just 1.5 hours from DFW is seeking local craftsmen and vendors to sell their wares to students, faculty, staff and the community." This event has been canceled due to inclement weather and rescheduled for March 3rd, 2012. "Banquet, Bikes, Barbeque, & Banging Cars will be held on December 3rd. Come out to see amazing motorcycles and the Hottest cars in town while you chomp on barbeque, watch a great basketball game, and shop to your pockets contentment. Also featuring Local Radio Stations. 1208 E. Pleasant Run Rd. Banquet tickets are on sale now for $20.00. "Aubrey Middle School 1st Annual Arts & Crafts Extravaganza will be held at Aubrey Middle school. This new annual event will have more than 100 booths and offer a wide variety of items including jewelry, candles, home décor, and many more gift ideas for the holiday shopping season. Proceeds from this event benefit the annual 7th Grade Field Trip to San Antonio. This is an important field trip where the children get to visit places they have learned about in Texas History, such as the State Capital and The Alamo. This is an indoor event that will be held in the school gym, cafeteria, and hall ways of the school." 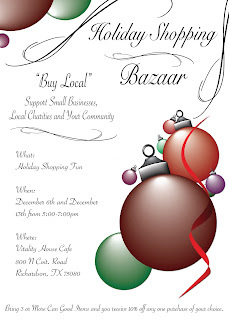 "Join us for our boutique style Holiday Craft Bazaar featuring the work of artisans and crafters from across the metroplex. Each vendor showcased features unique items for your shopping pleasure. Whether you are out to find the perfect gift for that hard please special someone or just looking for a pleasant time spent browsing for treasures, this is the place for you. Crafts, Food, Beverages, Music, Fun and Door Prizes!!" This event has been postponed due to weather and will happen on December 10th, 2011. "A fun event at Gentry Elementary School in Mesquite, Texas featuring crafting and food vendors from all over Texas." Twin Oak Drive is located off of Cartwright in Mesquite. "This is the LD Bell High School Craft Show which happens annually and features over 300 vendors!" "Come out and support your local community!" "For 22 years, the Keller High School Indianettes and the Indianette Service Organization have hosted the Christmas Arts & Crafts Bazaar. The Christmas Bazaar has become a Keller tradition and the Indianettes and their parents truly appreciate the support given by Keller and the surrounding communities. "